Every year during the summer, research groups at the CSC host some of the brightest A-level and undergraduate students eager for a taste of life in the lab. 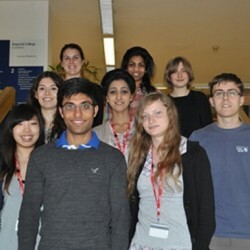 Funded by the charitable Nuffield Foundation, the two month placement allows students the chance to participate in projects as diverse as investigating neuron repair in the brain, challenging preconceptions about the relationship between diet and obesity, exploring pharmaceutical candidates for the treatment of septic shock, and making biological sensors for imaging applications. On Friday 26 August the students had the opportunity to present their work to their peers on the scheme, as well as other scientists based at the CSC and Imperial College. Among other revelations, the audience found out that it is possible to track the flow of energy within cells and that your mother’s diet and levels of body fat when she is pregnant with you can have a drastic impact on your own weight throughout your life. If you’re interested in taking part in our summer student programme, please contact Kate Baird, Student Administrator.